The attention of Ceelia.com has been drawn to a scam being perpetuated by a fraudulent guy who claims to be in love with his to-be female victims. See full details of the guy below. The guy in question meets ladies online and takes his time to build confidence and friendship with them. Then he claims to love and date them before he scams them. There is the danger of these fraudulent guy extorting money from victims based on these false claims. I am a lady who works and lives in Lagos Nigeria and this is my encounter with a scammer who almost scammed me of 24k. We met on badoo (social media app), we got talking for days and he seemed like a very nice guy, he said his name was Peter and that he works as an advertising agent for IMG models and he reside in UK. After a while, he asked for my WhatsApp number and I gave it to him. We started chatting on WhatsApp for days. He always checked on me every single day and night and always pretended to care about my wellbeing. I started developing confidence and likeness towards him. He told me all about him and how he was from Edo state and an only son with one sister and that he was planning to co!e back for his sister's wedding. So we kept talking and one day, he told me, he wanted to go shopping for his family and requested for the things I like so he could buy them for me. I was surprised because it was too good to be true anyway I told him I needed a shoe and a gown. So that evening, when he was supposedly back from shopping, he sent me pics of things he had bought for me. They were so many and I was excited. I said to myself "what an act of kindness this is" little did I know, it was all part of the scam. (Pics of the supposed gift below). 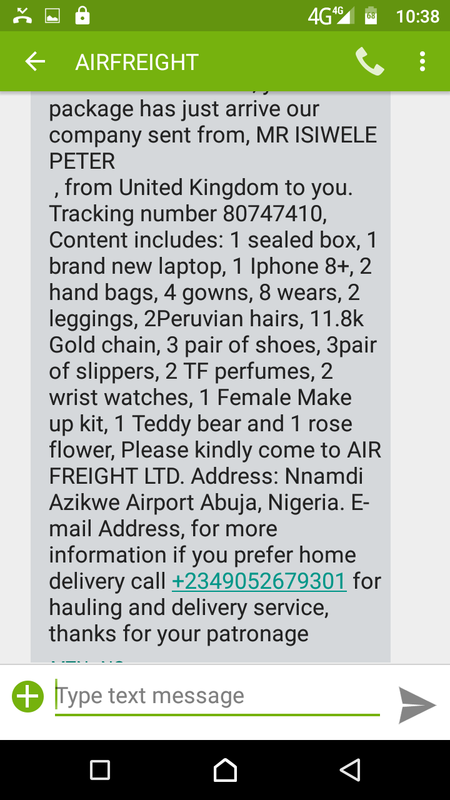 So he said he had sent them to Nigeria and that it would take 9hrs to get here.Then I got a message for Air Freight saying my package has arrived but instead of arriving Lagos, it arrived Abuja. There was a tracking ID and a number to contact, so I contacted the number and I was asked to pay the sum of 24,260 naira for the package to be delivered to my address. So I asked how the payment was to be made and they said bank transfer before delivery. So I asked for the company account number but they sent a personal account details instead. That was when I knew it was a scam so I shared my experience in a WhatsApp group and Two girls came forward telling me they were victims of the same guy. So I decided to expose him to prevent other girls out there from being scammed by this fraudster. Members of the public are hereby urged to be wary of the sort of scammer described above and take every necessary steps to bring this guy to Justice by sharing this post to all social media platforms and friends and family, NOT to communicate or disclose any personal financial details or send any money in response to any such messages or persons and to report any such incident to the appropriate law enforcement agencies.